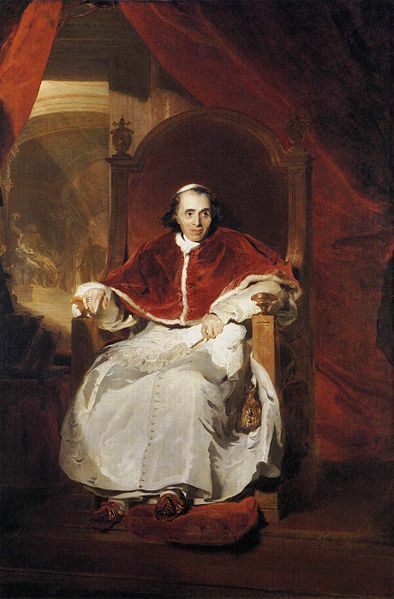 Pius VII`s papacy was dominated by relations with Napoleon Bonaparte. His predecessor, Pius VI had died in France while being confined by Napoleon. The conclave which elected Pius VII had to meet in Venice and not in Rome. The Pope did agree the Concordat of 1801 which reaffirmed the Roman Catholic Church as the majority church of France and restored some of its civil status. However the Concordat was tilted largely in favor of the state and the balance of church-state relations was firmly in Bonaparte's favour. Against the wish of most of the Curia, Pius VII travelled to Paris for Napoleon's coronation in 1804. For 6 years until May 1814, Pius VII was kept in confinement by Napoleon. It was only the final fall of Napoleon which led to freedom for the Pope. Napoleon had attempted to get Pius to abdicate and to negotiate a new Concordat, but he refused. His confinement was mainly in Savona near Genova on the Ligurian coast. The above portrait was painted on the orders of Napoleon in 1804-5. Pius had arrived in Paris in the winter of 1804 and would stay in Paris until April 1805 for the coronation of Napoleon. He was given an apartment in the Château des Tuileries. David had been appointed by Napoleon as the "First Painter in the Empire". He was commanded to paint an official portrait of the Pope. Originally David signed the portrait " LUD. DAVID. Napoleonis Francorum Imperatoris primarius pictor ". However after the fall of Napoleon, the latter words were painted over. 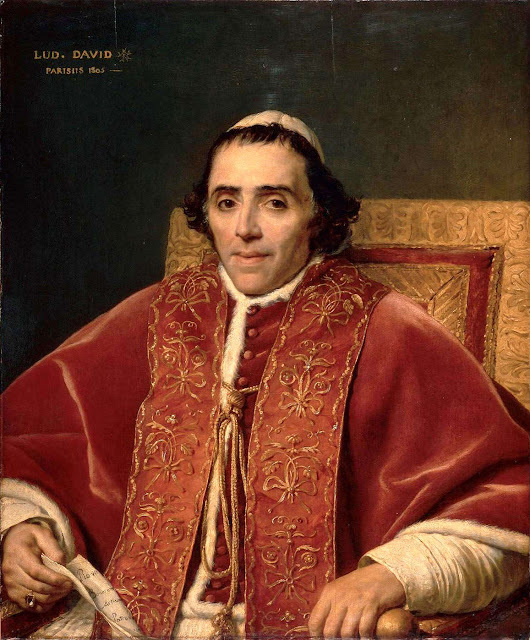 In the portrait, the Pope is holding a paper in his hand. On it are written the words " Pio VII Bonarum Artium... Patroni"
As a work of art, one cannot fault the painting. Everything is perfect. "Il est pauvre comme saint Pierre, les dorures sont fausses, mais cela n’est plus que respectueux. Enfin, il est évangélique à la lettre. Le brave homme m’a donné sa bénédiction. Eh ! mon Dieu oui. Cela ne m’était pas arrivé depuis que j’ai quitté Rome. " "C’est une étude particulière que j’ai faite pour être un ouvrage original ; ce qui m’a porté à le faire, c’est pour la prospérité - avoir une juste idée des traits et du caractère de ce chef de l’Eglise qui a vécu des moments difficiles et extraordinaires." Quite a conquest for the Pope - a reputed regicide, former major supporter of Robespierre, prominent freemason and fervent anti-papist. However the two men appear to have got on well going by the exceptionally warm response of David to the Pope.It shows in the portrait: the pope is shown as modest, serious, alert and in David`s words "beautiful"
"I confess that I have for a long time envied the great painters who have come before me for their opportunities which I never thought I would ever encounter. However I have now painted an Emperor and at last a Pope." After the fall of Napoleon in 1815, David had to leave France. He considered going to Rome. The Pope supported his application. However David was barred by the French authorities from going there and ended his days in Brussels. Pius VII was also painted/sculpted by Camuccini, Wilkie, Pinelli, Minardi, Bertel Thorwaldsen, Ingres, Lawrence and Canova. His features were so frequently represented including in popular prints that, with the exception of Napoleon, he was probably the most widely recognised man of his time. His quiet heroism, his strong commitment to his mission, his adherence to passive resistance, and his public near-martyrdom before regaining his liberty and his capital made him transcend national and religious differences to become one of the most widely admired men of his age. He was a symbol in his time for the victory of Peace over War. The standing of the Pope is perhaps best shown in the painting by Lawrence (below). In his lifetime, Lawrence achieved social and artistic success. He was the English painter who was Joshua Reynolds' heir and his successor in the role of official court painter, and was one of the most famous English portrait painters of the 19th century. He was commissioned by the Prince Regent of the United Kingdom (later George IV) on an official royal mission to paint the first post-Reformation portrait of a Pope and a full length portrait, as well. It is still in the collection of HM the Queen in the Waterloo Gallery in Windsor. It is normally regarded as Lawrence`s best painting. Thank you Byron for your kind comments. Like you I often wondered why Pius VII was never a serious candidate for sainthood. He had many noble qualities and was widely admired throughout Europe and beyond while he lived. Perhaps it may have had something to do with the fact his Secretary of State (Consalvi) had many foes in the Church and was disapproved of by many despite the fact that he was one of the most successful administrators and diplomats in the Nineteenth Century. Pius VII was a great man, surely deserving of beatification. The Vatican should establish a cause for his beatification.